Miami Stadium, later renamed Bobby Maduro Stadium, was a minor league baseball stadium that also served as the spring training home to the Brooklyn and Los Angeles Dodgers and the Baltimore Orioles during its 52 years in existence. Razed in 2001 after years of neglect, the stadium site is now apartments but the history of the ballpark is significant enough to inspire a full length documentary and book. The 2007 documentary White Elephant: What Is There to Save? explores that history from its opening as the first stadium with a cantilever roof that covered most of the seats without any obstructions from posts to the exploits and factors that led to its construction and eventual demise. 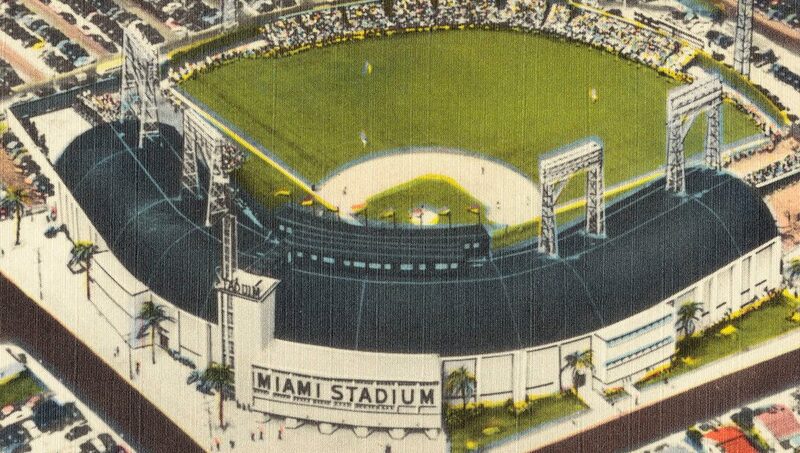 Opened in 1949, the stadium was home to the Miami Sun Sox from 1949-54, the Miami Marlins from 1956-60, the Miami Marlins/Orioles from 1962-1988, the Miami Amigos in 1979 and the Gold Coast Suns in 1989 and 1990. The Orioles held spring training at the stadium from 1959 to 1990 and the Dodgers played their first game as the Los Angeles Dodgers there. Check out the film below or at Vimeo.